More Americans own laptops today than medieval men owned swords. But how can you get one if your credit score looks like it belongs in the Dark Ages? You’ve got a few options, and we’ll get into a variety of ways you can afford one. Instead of financing a laptop specifically, you could opt for a personal loan and then buy the laptop outright. The three lenders below have been reviewed by the BadCredit team and have received 3 out of 5 stars or higher and offer long-term personal loans that will allow you to pay off your new purchase over time. The application process for a personal loan from these lenders can be completed online in about five minutes. If you only need a short time to repay the cost of your new machine, check out these top-rated lenders offering short-term personal loans. As with the long-term loans, applications with these lenders can be completed in minutes through their websites. These can be from any sort of retailer. Usually they come with offers such as no interest for a few months when spending over a certain amount. These five retailers all have a credit card that you might consider applying for and using. 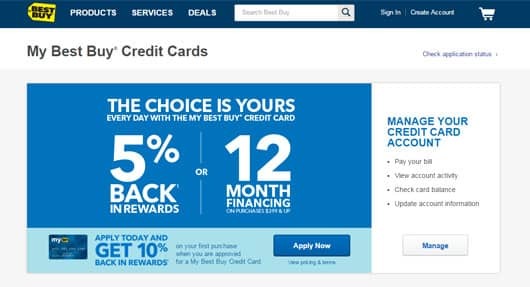 Best Buy’s credit card could result in interest-free financing for 12 months. However, when you have bad credit, these are less probable options. There’s an approval process, and only applicants with fair to good credit will be approved. You might get one despite this, though. And hey, applying for and getting a store-based credit card can be the first step to improving your credit score. Lease-to-ownership services function by allowing people to essentially rent products, in this case a laptop, and let those rental payments go toward owning the rented item. By making weekly or monthly payments for one to three years, you’ll be able to use a laptop while paying it off (kind of like a car payment). 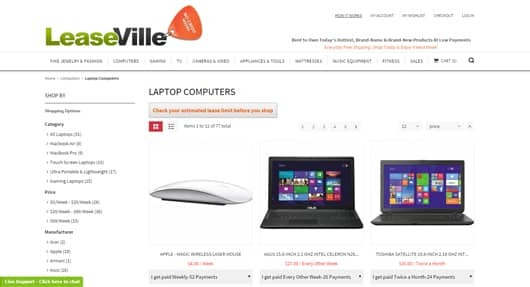 LeaseVille offers laptops and accessories with payment plans that can work for anyone. Services like these help those with no, little or bad credit keep up with people who’ve been lucky enough to avoid financial issues, but if you go this route, you’ll be paying more than double the retail price of the laptop before you actually own it. The laptop you always wanted is out there. You just have to go get it. After graduating from the University of Florida with under $6,500 in student loans, Logan joined BadCredit.org as an editorial assistant. He has written for newspapers and websites from Florida to Australia.